We’d love your help. 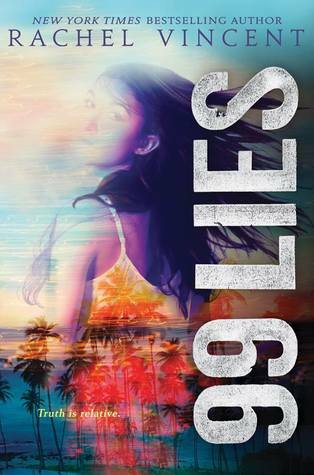 Let us know what’s wrong with this preview of 99 Lies by Rachel Vincent. But there's no escaping the spotlight--or the truth about the ways they betrayed each other in the jungle. And this time, the real threat isn't kidnappers--it's what the "friends" might do Getting kidnapped over spring break was definitely memorable. But now that the surviving hostages are home, they want life to feel normal again: high school, dating, million-dollar galas. To ask other readers questions about 99 Lies, please sign up. Does this work as a stand-alone book if you haven't read the first one? TinaMarie No, you really need to have read the first book to understand what's happening. Between 2 and 3, honestly... more like 2'5. I feel bad giving it 2✩ but then kinda feel 3 are too much... so no ✩ given. 99 lies pick up exactly where the last book left off, post-kidnapping—at least for most of them. Genesis and Holden are still stuck on the island and everyone that’s made it back on American soil are worrying about their health and safety. In the most unusual way, they go about trying to save them, making sure the world does not forget they didn’t all make it back. Genesis is starving, dirty and just all out sick of being stuck on the island with two crazy people, one being a relative. She has no 99 lies pick up exactly where the last book left off, post-kidnapping—at least for most of them. Genesis and Holden are still stuck on the island and everyone that’s made it back on American soil are worrying about their health and safety. Genesis is starving, dirty and just all out sick of being stuck on the island with two crazy people, one being a relative. She has no idea how she’s going to make it out, but she’s determined to figure it out. She’s getting home—by any means necessary. This novel like its predecessor is fast-moving and contains a unique political angle. Secrets are kept and revealed. Characters lives are threatened. Trust is thin, and romance is rampant. The series is thoroughly entertaining and with alternating points of view, it gives the reader the story from two angles. Though the story has a number of main characters, it never got confusing or befuddled by too many thoughts going on at once. A wonderful addition to any book lovers shelf, of any age—and another winner from Rachel Vincent. Highly recommended. 99 Lies wasn't quite as good as 100 Hours, because Genesis kind of deflated for a while. I loved the overall story, though, and how crafty these teenagers were when they faced danger. And I'm also wondering if there will be more in the series - there is definitely enough to tell in another book. This second book totally takes over where first left off and even though the conflicts, drama and intensity focus is different they are still all there from beginning to end. For Genesis, Holden, Indiana, Luke, Maddie and Penelope the nightmare should be over but seems like a new set of problems follow the teens home instead. What does not kill you makes you stronger does apply to these young people but someone forgot to tell them that death is not always the worst that can happen to us anyway. For This second book totally takes over where first left off and even though the conflicts, drama and intensity focus is different they are still all there from beginning to end. For me as the story counted down to it's conclusion the inevitable truths revealed cleared up shadowy areas and the finale that was presented was satisfactory justice but not a complete one on all counts. Once again alternating points of view give insight into the main characters motivations and what really clinched the enjoyment for this reader was the fact that heretofore thoroughly self-engrossed Genesis became a better person thanks to her ordeal and cousin Maddie finally owned her self worth as well. This was an excellent ending to this duology. Not as amazing as the first because there was no more kidnapping, but I’m glad to know what happened to all my pals. I loved this duology, this book, and this author! I admire her for taking a very controversial topic and having the guts to write a story about it. She clearly didn’t pitch this book as propaganda and the story didn’t steer you to a specific opinion. As for the characters, they were great. I loved Genesis and Maddie. There were a lot of real personalities that the Author depicted. I felt like for a lot of this one not much happened. Most of it was the kids reacting to what happened and them being jealous of each other. Maddie seemed to go through the worst as she found out some family secrets that rocked her world and had to deal with her mother who couldn't deal. Genesis seemed to be playing a game of chicken with everyone except Maddie and Indiana. I didn't care for her in the first book, but her actions in this one made me like her better. I really liked how when humil I felt like for a lot of this one not much happened. Most of it was the kids reacting to what happened and them being jealous of each other. Maddie seemed to go through the worst as she found out some family secrets that rocked her world and had to deal with her mother who couldn't deal. Genesis seemed to be playing a game of chicken with everyone except Maddie and Indiana. I didn't care for her in the first book, but her actions in this one made me like her better. I really liked how when humiliated she stood up for herself. The ending to this one was a bit crazy. It will be interesting to see where things go from here. This review has been hidden because it contains spoilers. To view it, click here. Continuing the story of six teenagers kidnapped in Columbia, three are back in the states, two are still with the kidnappers and one is MIA. Genesis endures a starvation and neglect, they throw Holden in with her and pit them against each other. When they finally escape thanks to Indiana Holden blackmails Genesis. The story jumps back and forth from what is happening with Genesis and what is happening with Maddie and Luke. It's very chaotic, multi storylines and confusing to follow. Such a good continuation! I was sceptic about the first book needing a sequel but I am so glad there was one. The story continued with just as much intensity as the first book, even without the jungle. The characters were seen through a new eye being in there own world. Everything was brought together in a great way with an epic conclusion. 99 Lies picks up exactly where 100 Hours ends and look, don't pick up 99 Lies if you haven't read 100 Hours. Genesis and Holden are in the care of their kidnappers. Indiana is missing. Maddie, Luke and Penelope are back home trying to acclimate into their old lives. It's fast paced, gripping, and a book you just do not want to put down. Wow, this book was so fantastic! Different from the first book, because the characters that we're rooting for have the truth, and are almost all back in Miami. Such a great book! 4.5 stars. Love it. Great sequel and conclusion. No lulls in the story, if that makes sense. Kept my attention and I didn’t want to put it down. I don't think this book was needed and it could have been one whole book but I still think a lot of people might enjoy this.